Change your perspective on something by looking at it from above is this weeks photo challenge. The best view of the floating markets of Bangkok is definitely from Above. 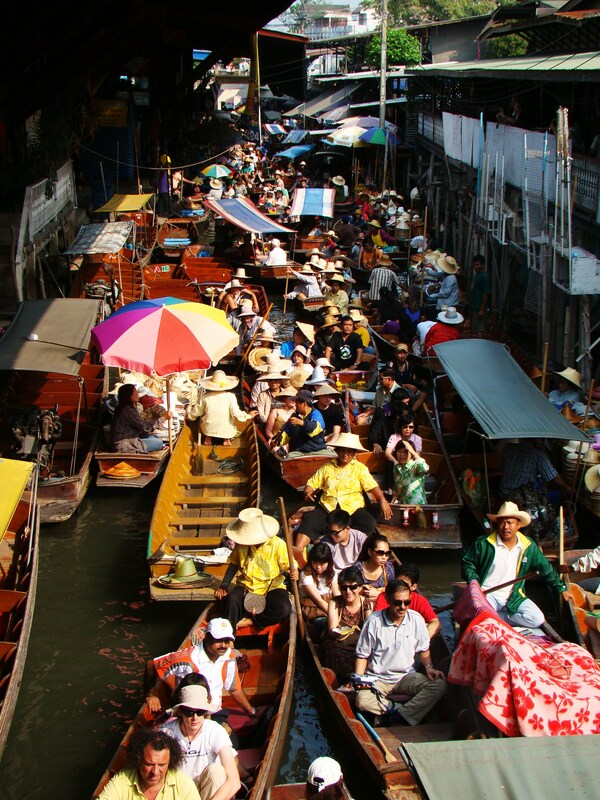 One of the most famous pictures of Thailand, and one of the most visited tourist sites on the outskirts of Bangkok, is the famous Floating Market. While visiting Thailand, going to the floating markets was definitely one of my highlights of Bangkok. I headed out to the floating market on a morning tour and loved walking around the market in the midst of the buying and selling bustle. The original canals which now make up the Floating Market were built in 1866 on demand of His Majesty the King of Thailand to help ease communication in the province. The actual Floating Market started in 1967 and today thrives with hordes of tourists from all over the world. Most of these boats are mobile food stores selling anything from fruit to barbecued chicken. I sampled quite a couple of the different delicacies that were on offer. 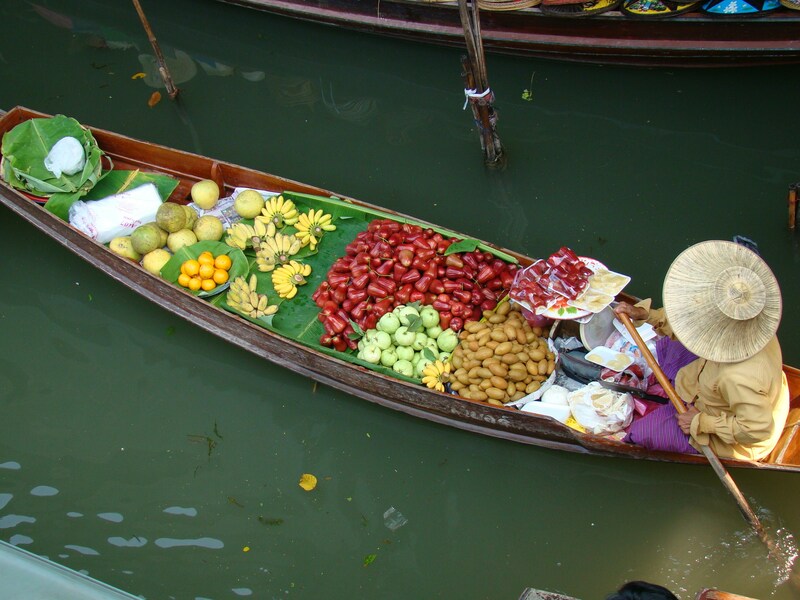 The fruit looked so fresh and delicious but I ended up only sampling all the little things freshly cooked on these floating boats. If you are ever in Bangkok, make sure you visit a floating market and be sure to do it on an empty stomach! Thanks Penelope! 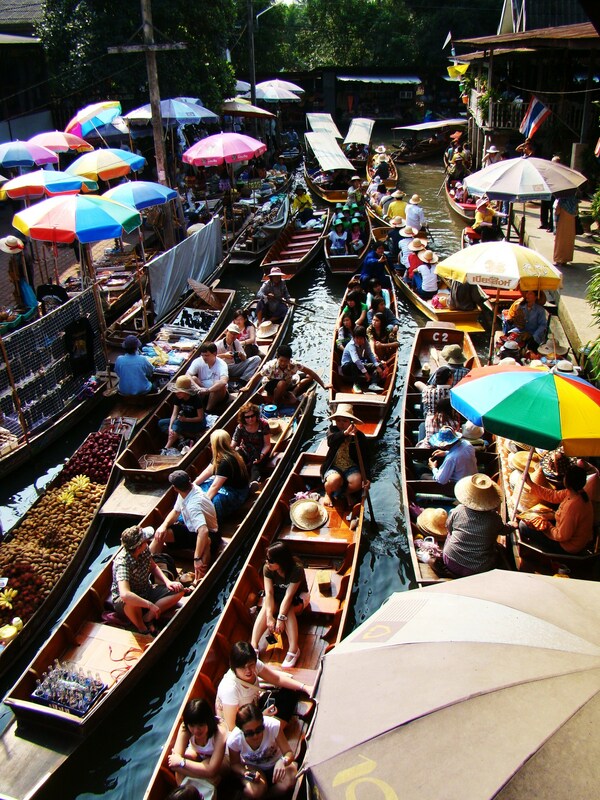 When you get to visit Bangkok you must definitely go to the floating markets, it is such a great experience!! Thanks Celeste!! I also found that the only place that wasnt crowded with people trying to buy things were the little bridges than ran acros the rivers. Great for getting a lovely view of the boats and all their colourful goods! So much activity and a wonderful array of tropical fruits, beautiful shots Janaline! Thank you!! These floating markets are a perfect place to spend the morning and you can easily fill up all the momory space on your camera in one morning!! Awesome visuals give a powerful sense of place. Thanks!! The floating market offered so many photo opportunities that it was quite hard to decide what to photograph first! Great stuff! Your blog is very rich with content. That’s hard to find. You are welcome Sue! I would definitely recommend the floating markets if you ever get the chance to visit Thailand! This was definitely one of my highlights in all my travels so far! Fascinating pictures. You’ve captured the vibrancy of the market. Thank you for the compliment!! The market was so busy that day that it was sometimes quite difficult to actually get the picture that I wanted! One of my favorite stops in Bangkok – great choice! Thank you! I really enjoyed Bangkok, although next time I will try and avoid visiting during the summer, it was just to humid and hot during some parts of the day to actually walk around! Thanks Angie!! The floating market was filled with such an array of bright colours that I had difficulty deciding what to photograph first! So vibrant in colors! Any clue what are those exotic fruits in red color (the ones look like red pepper)? Unfortunately I have no idea what the names of the different fruit are, sorry. I think it is something that they have been doing for years and years and is quite amazing to see and experience! These floating markets are definitely one of the most interesting places that I have ever had the opportunity to visit! Fabulous photos! It’s all so vibrant and colourful. Thank you!! The market is filled with such brightly coloured fruits and products, its beautiful! Yes it does get quite busy and quite difficult to actually move around and get a good look at all the products that are being sold! The bright colours are definitely what makes this market so stunning! It is amazing to see and experience the buzz of this market and get a glimpse of the Thai culture! You took beautiful photos of the famous Floating Market! Wonderful entry. Thank you Amy! It was such a lovely morning experiencing Thai culture! 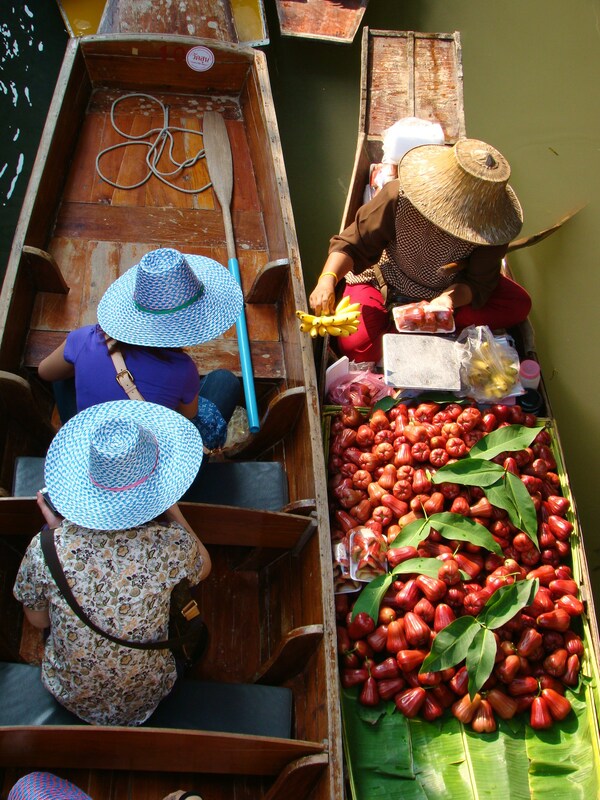 Love the photos of the floating market! I also like that you included some history of the floating markets! Look forward to following more of your travels!! Thanks for checking out my blogs at http://traviscaulfield.wordpress.com and http://traviscaulfield2.wordpress.com. You are welcome!! Enjoyed exploring the floating market and took loads of photos that day, more than I should have!